When it comes to supplements, probably nothing is more confusing than buying a green superfood. With so many different ingredients in each green juice mix (including some really strange ingredients you probably haven’t heard of! ), how are you supposed to know what is the best green superfood powder? This guide is meant to help you make sense of the best green powders so you get the superfood mix that has the nutrients you need, fits your budget, and hopefully also tastes good! Why Take a Green Superfood Drink? What’s the Difference between Green Food Drinks and Multivitamins? Best For: People who want a nutrient-boosting green drink without spending a fortune. Nested Naturals (formerly IntraNaturals) is one of the best-selling green supplements, mostly because of its affordable price. 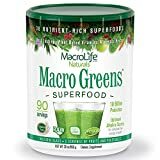 For a cheap green superfood powder, it is still loaded with 8 grams of nutrients per scoop that will give you energy and keep your body healthy. The 40+ ingredients are divided into blends: Alkalizing, immunity, antioxidant, enzyme, probiotic, and fiber blends. It’s a bit annoying that these are propriety blends, meaning you don’t know how much of each ingredient there is. However, the ingredients are all high-quality and they include probiotics and bromelain for improved bioavailability. Best For: People looking to lose weight or need to detox their liver. You’ll notice some ingredients in this green supplement that aren’t typically in others. For example, the milk thistle seed extract is great for detoxing the liver. The turmeric helps reduce inflammation. The beet root extract helps improve performance. The combination of these ingredients makes it ideal for anyone who wants to lose weight or has a lot of toxic buildup in their bodies. It does contain Stevia, so the taste is pretty sweet. Best For: People who want to feel awesome! 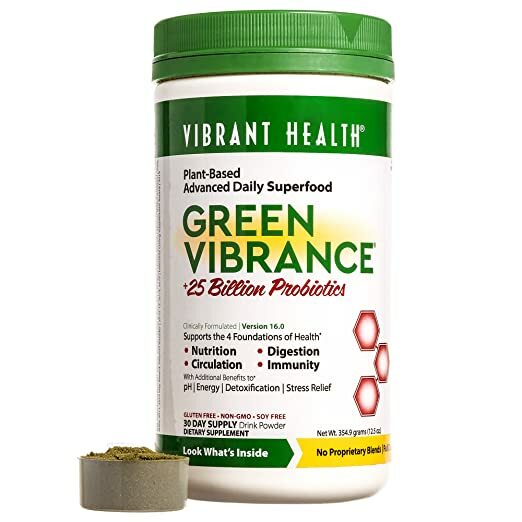 Green Vibrance superfood drink doesn’t contain propriety blends. They list the amounts of each of their ingredients. Reading through their label, it’s easy to see why they are proud to do so! 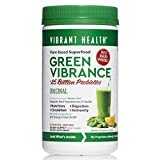 The green powder contains an impressive list of ingredients for supporting nutrition, digestion, immunity, energy, bone support, and mental clarity. 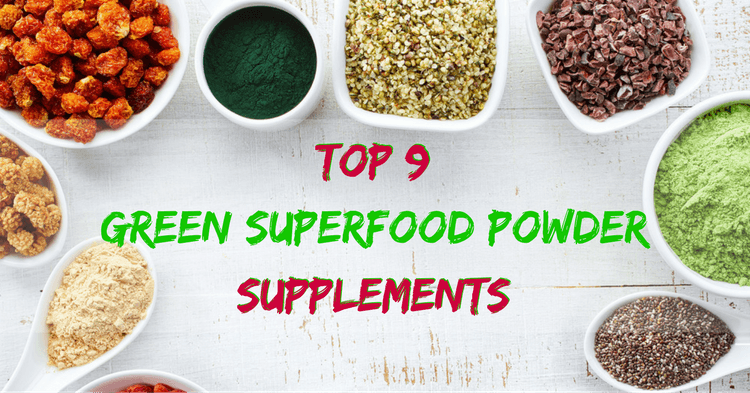 I particularly like that they include an adaptogen blend in the superfood powder, which is important for combating the negative effects of cortisol and stress. The only major downside other than the bad taste (which is to be expected with a quality green supplement) is that it’s pricy – but you get what you pay for. Best For: People with digestion issues. 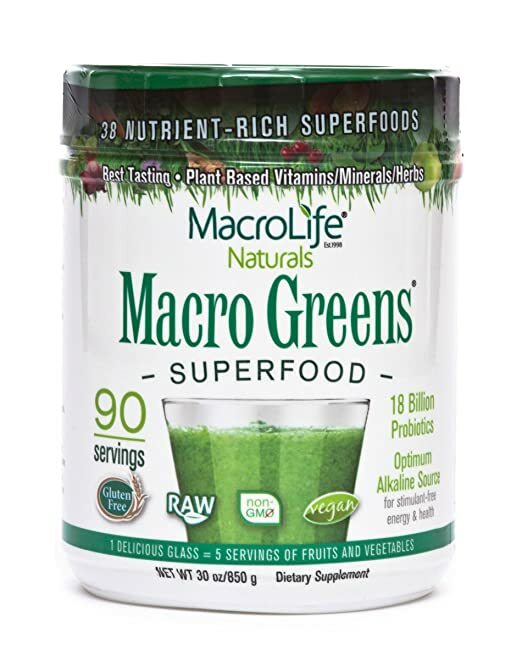 When formulating Macro Greens superfood drink, the makers took a lot of care to make sure no common allergens were included in the mix. The superfood also has a lot of ingredients which can support digestive health, such as ginger, licorice, and probiotics. If you have digestion issues, it is worth trying this green drink. Just be warned that some people with IBS or SIBO don’t react well to green drinks because the probiotics and fibers can upset intestinal bacteria. Best For: Athletes and people with demanding daily lives who could really use extra energy and nutrition. 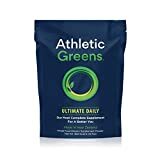 All around, Athletic Greens is considered one of the best green juice powders for its high-quality ingredients, balanced blends, and nutrient support. The only complaint that I have about it (and is shared by many other users) is that the green powder is pricy. 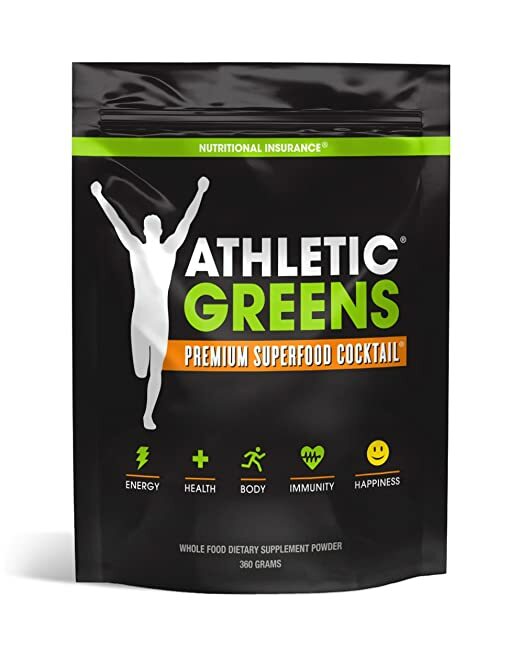 Despite the high price, a lot of reviewers say that they will continue using it because they can actually feel a difference in their health and energy levels after using Athletic Greens. On the plus side, if you are taking Athletic Greens, then you can probably ditch your daily multivitamin and save money that way. Best For: People who don’t like eating their veggies and people who need more iron. 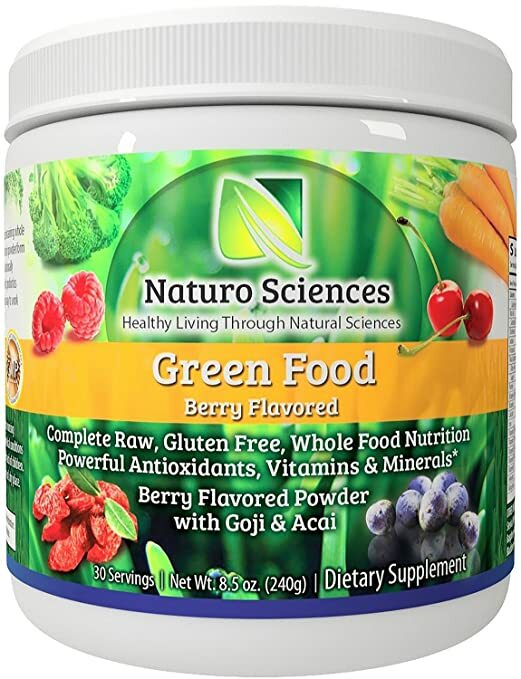 Naturo Sciences Natural Greens is one of the most affordable super green drinks you can find. Of course, for the price, you can’t expect it to have as many high-quality ingredients or organic superfoods. While it might not be the all-around best green superfood mix, Natural Greens does have a good nutrient blend. Note its high iron content (10% of the RDA). 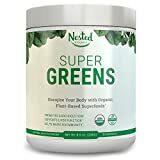 For people who aren’t getting enough iron, such as vegetarians who don’t eat greens and whole grains multiple times per day, Super Greens is an easy way to get complete nutrition without the hassle. Be warned that iron can cause some digestive issues when you start consuming more of it (black stools, constipation, etc.). The fiber blend in Natural Greens counteracts these side effects. Still, it might be smart to start with a half dose until your body adjusts to the superfood drink. Best For: People who are serious about organic superfoods. Garden of Life is a very well-known company for their high-quality raw organic supplements. Choosing raw supplements means that more of the nutrients stay intact and that the body can absorb them better. Because it is a certified organic greens superfood, you can rest assured that there are no GMOs or chemicals lurking in the mix. One important thing to note about Green Raw Superfood Powder is that it doesn’t contain any green tea extract or other caffeinated energy boosters. So, don’t expect it to immediately give you energy. It takes time for your body to absorb and utilize nutrients on a cellular level. After about 2-4 weeks, you should start to feel the benefits of this organic superfood juice because of the improved nutrition it gives. Considering that this is one of the best organic green superfood juices, it is a good value. Store it in the refrigerator or freezer after opening to keep the raw nutrients active. Best For: People who want a nutritional boost but are otherwise healthy. 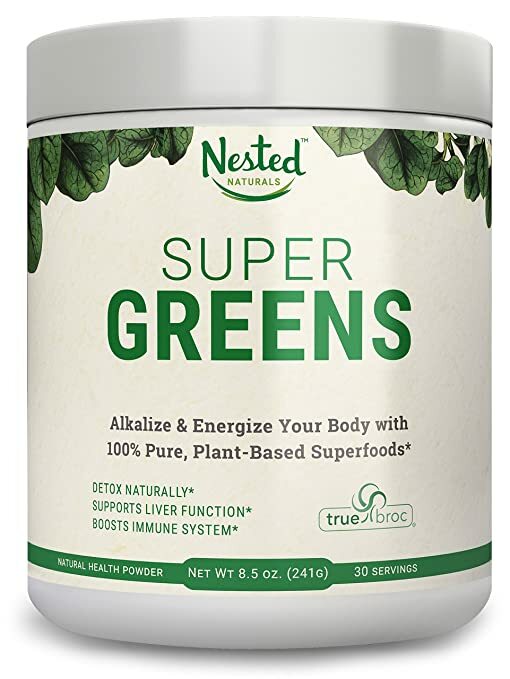 Before you get too excited about the low price of this organic superfood drink, note that there are only 20 servings per container instead of 30. It is still a good value, but not quite as cheap as it seems when you calculate the cost per serving. The reason Orgain manages to be so affordable despite having organic ingredients is because it skimps on some of the higher-quality ingredients, like spirulina and chlorella. It does contain wheatgrass and lots of sprouts, so you’ll still get good nutrition from it. Don’t expect miracles from this superfood drink. 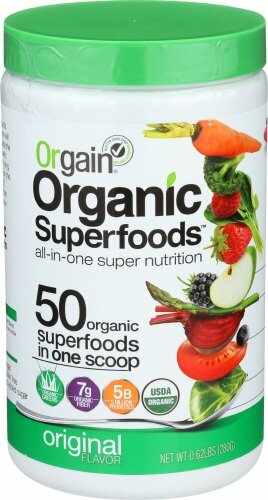 However, for people who don’t have health issues and just need something to give them an extra boost, Orgain Organic Superfoods is an affordable option that tastes good enough. Best For: People getting started with green superfoods. 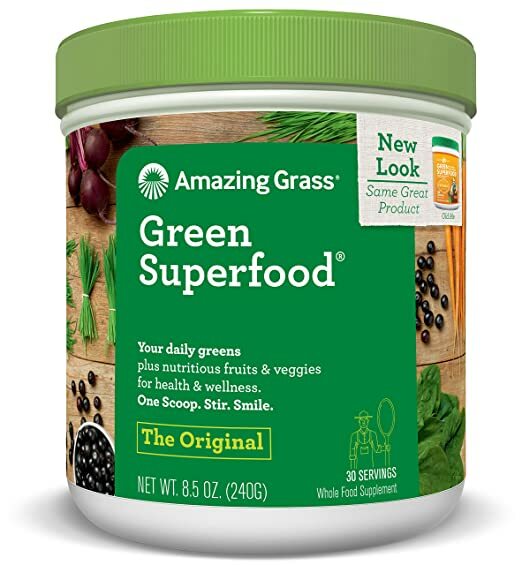 If it is organic green nutrition that you are looking for, Amazing Grass Green Superfood delivers. It has a fairly-high amount of organic greens per serving (5.7 grams) as well as some other supporting ingredients. Don’t expect too much in terms of other superfoods though. The ingredient list is fairly simple (at least compared to what some of the pricy super greens include!). 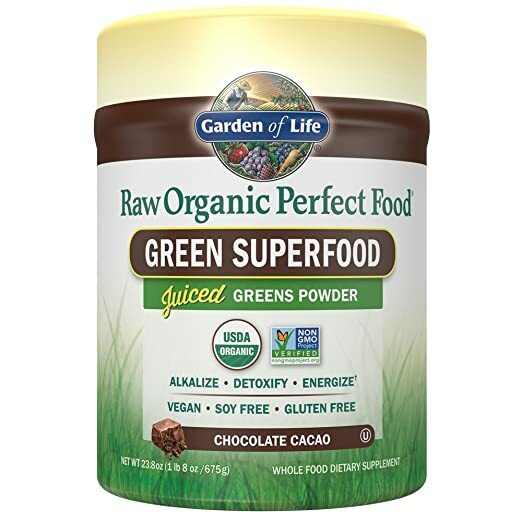 However, because of the price and high amount of greens per serving, this is one of the best organic superfood powders you can get. Let me preface this by saying that even the best green supplement won’t make up for a poor diet. However, most of us are not eating anywhere near the recommended 5 to 9 servings of fruits and veggies daily. Taking a green supplement can help fill in that gap. This list doesn’t even include deficiencies in other nutrients like antioxidants and enzymes. Again, taking a superfood supplement isn’t going to fix all of these nutrient deficiencies if you are eating a diet consisting of junk food. However, it can help fill the gaps in your diet and make up for poor-quality food. Some people report feeling benefits from green supplements right after taking them. Realistically, it is probably going to take a few weeks before you start feeling any benefits. Your body needs time to detox and fix nutrient deficiencies. For example, it can take weeks to replenish depleted iron stores and make new red blood cells. One of the biggest claims that many top green supplements make is that they alkalize your body. The idea behind the alkaline diet is this: Foods you eat can change your body’s acidity level. High acidity results in calcium depletion from bones and other supposed ailments. Here’s the thing: There is conflicting evidence about whether the alkaline diet actually has any benefits. There is very little research supporting the alkaline diet, and many will say that it is a big scam. However, the alkaline diet (which supports fruits and veggies while discouraging meat, dairy, and grains) does have some benefits based on the nutrition of the foods alone. For example, eating more greens (which are rich in calcium and bone-supporting vitamin K2) is shown to prevent osteoporosis. Whether the alkalizing properties of the greens has anything to do with this is still unclear. 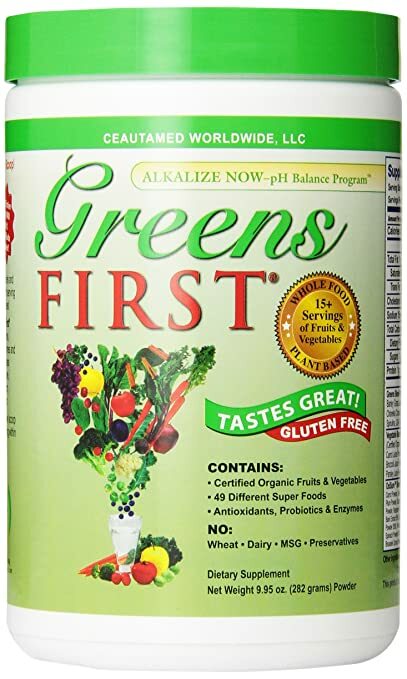 In short: Don’t put too much faith in claims that green superfoods will “alkalize your body” – but it doesn’t mean those greens don’t have other benefits which actually are backed by science! Each of these types of greens are superfoods in their own right – but no superfood is perfect! To get the best superfood powder, look for one that has multiple types of greens from each category. The best superfood green drinks contain a lot more than just greens now. You’ll find ingredients which support nutrition, provide additional health benefits like boosted immunity, or help improve absorption of the ingredients. The other ingredients in green juices can also be broken down into categories. The best green drink powders will have ingredients from each category. Cheap green juice powders might have just greens and nothing else. Antioxidants: Antioxidants boost immunity and fight the signs of aging. Note that you are already getting a high amount of antioxidants from the superfood greens. Minerals: Calcium, iron, and magnesium are a plus for people who don’t eat many whole grains or vegetables. However, be warned that added iron can sometimes cause digestive issues. Enzymes: Bromelain is a common plant-based enzyme you’ll find in super greens. It, along with other enzymes, helps improve the absorption (bioavailability) of nutrients in the superfoods. Probiotics: These are healthy bacteria which have been shown to have positive health effects on the body. They improve digestion and some probiotics are even linked to curing conditions like eczema and IBS. People with digestion issues should be cautious about suddenly adding tons of probiotics to their diet. Often, the probiotics help – but some people find the probiotics actually aggravate their condition! Herbal Superfoods: Ingredients like milk thistle, rosemary, and dandelion extracts are great for detoxifying the body and improving blood circulation. Adaptogens: Ingredients like holy basil, cordyceps, and suma help reduce the effects of cortisol (the stress hormone). These are great for people with anxiety, hormone imbalances, or other stress-related problems. Fiber: Many super greens have added fiber. This helps you feel full longer and is great for aiding in weight loss. Take a look at the reviews and you’ll find that even the best green superfood drinks get bad ratings because of their taste. Unless you are one of the lucky few who actually likes the taste of spirulina, chlorella, and other super greens, you are probably going to hate the taste of whatever green supplement you choose. Mix the Superfood Powder into a Smoothie: This will mask the taste of the greens, especially if you add some honey or frozen berries to the smoothie. Choose a Green Powder with Stevia: Green supplement makers know that people hate how their products taste, so many have started adding stevia to mask the bad taste. Just be warned that the stevia can actually make the taste worse in some cases! Chug It Down: Instead of mixing the green powder with a full glass of water or juice, mix it with a smaller amount. Then you can chug it down quickly and get it over with! Switch to a Different Superfood Drink: If you haven’t acquired a taste for the green juice after a month, then switch to a different brand that has better ratings as far as taste goes. Find the Price Per Serving: To do this, take the total price and divide it by the number of servings. This is the price per serving. Expect to pay around $0.70 to $2.00 per serving. Is It Organic? Because of the risks of GMOs and pesticides, it is always best to choose organic superfood powders. However, that is going to add to the price considerably. How Many Grams Per Serving? This can be a bit deceptive because some superfood powders add a lot of cheap filler ingredients. Instead, look at the total grams of ingredients like spirulina and chlorella. Propriety Blend? Many superfood greens have propriety blends, meaning you won’t know the exact amount of each ingredient. You have to be cautious about these products because they often load up on cheaper ingredients. Servings of Fruits and Veggies: Some superfood powders say how many servings of fruits and veggies is in one scoop. This can be quite high. For example, the Greens First Nutrient-Rich Antioxidant Superfood listed above (#2) has 15 servings of fruits and veggies in it! That’s a good value. Are There Enzymes and Probiotics? This is a sign of a quality product and worth paying more for. Both superfood juices and multivitamins aim to fill gaps in your diet to boost nutrition. However, there are some key differences to know. Multivitamin supplements typically contain just a few nutrients. While these nutrients may be important, so are the many supporting nutrients that work with it. For example, it is well known that vitamin C helps with the absorption of iron. You could take an iron supplement, but it won’t be the same as eating greens which naturally contain iron plus vitamin C (as well as numerous other supporting nutrients). Even the best-formulated multivitamins can’t replicate the nutrition that comes from eating real foods! Compared to multivitamins, green food supplements are made from actual foods. Thus, they have a full spectrum of nutrients and are better able to provide support for the body. Iron Content and Digestion: Some green superfoods have high amounts of iron. Increasing iron intake suddenly can cause digestive issues like upset stomach and constipation. It may also give you darker stools. Allergies: Obviously avoid any green superfood mixes with ingredients you are allergic to. A very few people with hay allergies sometimes report allergy symptoms when taking superfoods with certain green grasses. 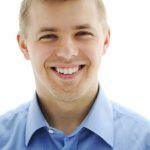 SIBO and IBS: People with SIBO and IBS have imbalanced gut flora. The probiotics and fibers in many superfood green supplements can worsen these problems. In some patients though, the superfood powder improves symptoms of IBS and SIBO. These conditions are so individual that you will have to talk to your practitioner and try it out for yourself. To avoid any possible negative side effects of superfood greens (or any other supplement! ), START SLOWLY! Take a ¼ or ½ dosage for the first few days and see how you feel. Gradually increase to the full dosage if you don’t experience negative side effects. Green superfoods can be mixed with water, juice, or into a smoothie. A lot of people prefer to take them in the morning to give them a boost of energy and nutrition for the day. However, it is up to you when you want to take the superfood greens. However, there is one case when timing of green supplements does matter: after workouts. Do not take green superfood supplements immediately post-workout. While it might seem like a smart idea to take your green drink after a workout, it is actually counterproductive. Your body is in a state of inflammation and recovery after training. Taking green supplements during this period can hinder your body’s ability to build muscle. Instead, wait at least 3 hours after exercising to take a green supplement. You’d be better off with a post-workout supplement. Hey, Brian thanks for the green superfood powders details. We really love these organic powder. We are using green powders in smoothies and food.